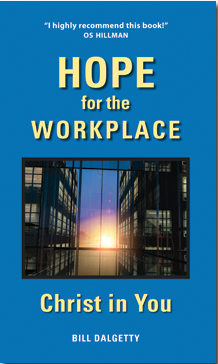 Bill Dalgetty (northern Virginia) has written a new book of stories and insights called Hope for the Workplace. In the book, Bill brings an optimistic message to Christians who must confront the harsh realities of the working world. His message: Christ is in you. It’s a reality that he says can transform the business world. Bill draws on his career of 38 years as a lawyer and executive with Mobil Corporation and 10 years as the president of Christians in Commerce. Christians in Commerce is a business-focused ministry that Louis Grams, Bud Rose and John Mooney founded in 1983. Perhaps as importantly, Bill relies on his long experience as a Christian and a member of the People of Praise. To make his points, Bill uses 51 real stories and examples drawn from community members and Christians in Commerce members he knows. But some of the best stories in the book are Bill’s own. In 1996, he became responsible for the global environmental, health and safety performance of Mobil Corporation. He soon learned that Mobil lagged behind its competitors in worker safety and in lost-time accidents. Word got out that Bill was preparing to report these negative findings to the board. One manager threatened him with “blood on the floor”—meaning Bill’s blood—if he went ahead. Despite the pressure, Bill made the report. After hearing it, the chairman of Mobil told all the executive vice-presidents, “I want us to change our performance in this area.” Over the next three years, Bill led the charge. Mobil rose from seventh place to second place in worker safety among the eight major international oil companies. Bill says his book is different from other Christian business books on the market, which tend to target Catholic or Protestant markets exclusively. Hope for the Workplace takes a broad ecumenical approach, with quotations from leaders such as Billy Graham and Pope John Paul II. Bill is offering his book for sale at a Christmas special price of $12.95. See his website www.zaccheauspublications.com for more details. Quantity discounts are also available. Thanks for the article, Sean. May the Lord use this book to change the workplaces we all labor in and to inspire us to greater commitment! Congratulations on the Publishing Company and book, Bill! This book really caught my attention. I participate with a group of guys who seek to support each other in life. How we live out our work commitments might be a great topic for conversation. I am going to suggest that we read this book together. Can't wait to start reading.